I had a dream yet again. In my dream, i found myself sitting inside a big room. I found myself alone. So I got bored and as a result , I dozed off ( in my dream). 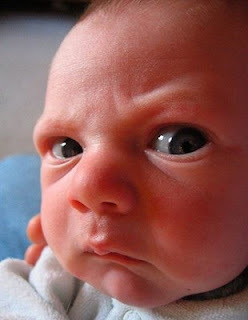 When I woke up (in my dream), I saw a one month old baby staring at me in anger. The baby did not resemble any of my girlfriends. I heaved a sigh of relief.The anger in the baby's face intensified by the minute. I looked at the baby and I was shocked because the baby resembled me. I did not know what to do. Guilt engulfed me. I grabbed the baby and ate the toddler. The next minute, I woke up from my sleep. I did not wet my bed. But Why did I have such a dream? Why did I eat the baby? Any dream interpretors out there to help me? no wonder..just try to recollect whether you had forced any of your girl friend to go for abortion after she turned passed the pregnancy test..
i have a doubt.. what is meant by pregnancy? maybe u were just hungry :D or u want to become a real adult no more childish acts (if u do so). if you are scared just by looking at this picture, just imagine my situation.. i had close contact with the baby.. but it tasted yummy (in my dream) just like coconut custard. ohh mine .. sitting @ home has made u a man-eater ?? Christ ! Chriz..i think u really need to look for another job!!!! tht was one weird blogpost..
you scare me!! you really really scare me! Clearly that baby knows something about you. man u and ur dreams hi hi donno wat label to give u.
EEKS! Did you check any websites to see what the dream means? ewwwwwwww u ate the baby?? U are Idi Amin's reincarnation. Maybe you watched Honey I Shrunk the kids, which mutated to (as often happens in dreamms) Honey I drunk the kids which mutated to honey I ate the kid. Or maybe you being a man, taking cue from your best friend, decided to eat your puppy. Dogs do it. In IT industry, at least twice I received a gross email forward in which cakes are shaped and decorated like cut human body parts rotting and oozing blood. They look so real, but you realise they are cakes cos the mail says so and you see the bakers decorating them. Maybe the baby was a masterpiece. shall i pass dis post to my dad? where did u get this kid's pic from? i almost fell down from my chair! this is exactly how my boss looks at me when i ask for leave!